Heat oven to 175°F. Place rolls on cutting board. Let stand 10 minutes or until partially thawed. Meanwhile, in 1-quart saucepan, heat brown sugar and butter over medium heat, stirring constantly, until butter is melted. Stir in corn syrup and whipping cream. Pour brown sugar mixture into 9x5-inch loaf pan, covering bottom completely. Cut each cinnamon roll in half crosswise. 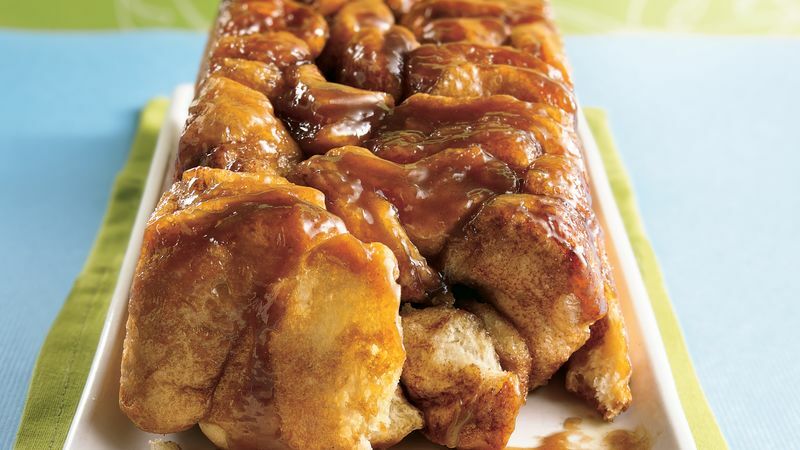 Arrange roll halves randomly over brown sugar mixture in pan. Cover loosely with plastic wrap sprayed with cooking spray. Place pan in oven and turn off heat. Let rise 1 hour 10 minutes to 1 hour 30 minutes or until loaf has at least doubled in size and top of loaf is 1 inch from top of pan. Remove from oven. Heat oven to 350°F. Remove plastic wrap. Bake loaf 25 to 30 minutes or until golden brown. Place heatproof tray or serving plate upside down over pan; immediately turn tray and pan over. Let pan remain 1 minute so caramel can drizzle over loaf; remove pan. Serve warm. Corn syrup is available in a light and dark variety. Light corn syrup, which has a milder, sweet flavor, has been clarified to remove color and cloudiness. If you like pecans, add chopped pecans to the caramel mixture in the pan.